Saying "Formerly formal discipline of reviewing becomes a free-for-all for online amateurs"
Almost a month ago I agreed to be interviewed by journalist Justin Berton at the San Francisco Chronicle for an article about online restaurant critics that was inspired by the Jeffrey Chodorow palaver. Since Berton does not work for the food section, it was interesting to collaborate with him - in my view he approached the question about online food criticism from a more objective view point than a food journalist might. They sent photographers around... took my picture... in silhouette to preserve my anonymity... and I waited... and nothing. I learnt that the Food Section was apparently writing a similar article and so Berton's piece was put on the back burner. I had simply accepted that the piece would never run. So imagine my surprise this morning when I woke up to a congratulatory email from a friend several friends alerting me to the fact that today I am in the paper. The article is quite different from the one that Berton originally talked to me about. I am quoted as saying my 'training' comes from "eating food every day for the past 40 years". This designedly flippant remark of mine was supposed to be a humorous response to the journalist's questioning about whether critics should have formal culinary training or not although that argument isn't really touched upon so thoroughly in the final article. Restaurateur Teo Kridech of Senses is rightly bitter after being shafted on Yelp, saying "Everyone has become a food critic. They think they're real big shots. They probably can't even make scrambled eggs.". To him I would counter back that the rather arrogant view of his customers, would be better kept to himself if he hopes to attract good will and clientele since some of us 'amateur critics' certainly go beyond simply making scrambled eggs and actually go so far as to experiment to see if we can make them even better. Today's article in The Chronicle is rather tired and dull. It doesn't really say anything new. Michael Bauer doesn't even bother to give his fellow bloggers the time of day when he states "I do think the traditional critic still has the most singular influence, but the playing field has been leveled significantly with sites such as Chowhound, Yelp, Citysearch and even Zagat," he said. "No longer does the newspaper have a lock on the information. It keeps us all on our toes." Same old, same old. Mr Bauer - get with it. Haven't you heard of Blog Soop? Forget Chowhound, Yelp and all those other forums for anonymous online contributors to mouth off with barely care or thought for anyone. Show some respect to your fellow food bloggers, the ones who who take the time and the trouble to write restaurant reviews. The ones who really make efforts to go beyond emulating you. The writers who actually spend some time and thought on their words, people who might display some ethical judgements and who operate transparently. Food Bloggers might be a minority, but they are a stellar one. Kevin explores the culinary hole-in-the-walls, the greasy spoons, the lunch counters looking for that diamond in the rough. Who are John & Janine? I am not sure, but one thing is for sure I want to live it up like they do. They must have a fabulous life. Our favourite Bunrabs dine out with lots of pictures. A job-hating attorney celebrates the only agreeable side effect of her heinous job - dining out frequently - and shares the experience online. In this left-wing, local-produce, low-mileage, Alice Waters-worshiping city, it's tough to find a genuinely exquisite vegetarian meal. Join the search here. A lawyer with a heart of gold, high-end tastes and a tendancy towards fine dining. An everyday, law-abiding citizen who has a passion for exploring the planet’s diverse and inexhaustible cuisines. All I can say is that I want Chuck's life. He even has a 2007 eating itenary planned! He lives in San Francisco but attempts to eat in the best restaurants all over the world. Only in San Francisco - the top local resource for taquerias and mustaches. It seems like the article is mostly about Yelp - and that road has been trodden before. Thoughtful blog posts have nothing to do with those flippant commentss, and everyone knows to take the windbags on Chowhound (myself included) with a grain of salt. I don't think your comment comes off badly at all, if it's any consolation! Obviously everyone is entitled to their own opinions and I personally think that newspaper reviews are far more damaging than blog reviews. Most food blogs don't have the breadth of readership as Beck&Posh, for example mine only gets around 200 hits a day so I don't feel a scathing or glowing review will make or break a restaurant. Furthermore, blogs are completely subjective, as are any reviews, and restauranters should take note of any repeated criticism and not just 'dissing' of Ikea crockery. And I think that your section of the article came across fairly. I actually enjoyed the article, especially Ed Levine, I was hoping they would include him because I know he reads Chowhound closely, and sure enough they did, and I think he gives an encouraging example -- someone who actually listens to what customers are saying and takes action, but who also doesn't view the criticism as gospel truth. Through his consulting and various companies Ed actually has influence over many restaurants in the Bay Area. The story was actually very well source. I feel your pain on the quote but as someone who writes newspaper articles I know it is also a tough choice as a writer to go with a punchier quote more appropriate the flow of the story when it means discarding other quotes the writer knows better reflect the whole of what the person said. In the end these choices can make for better-reading articles, and in a story with a dozen or more quoted sources there just isn't space to get into the nuances of what each person said. The writer clearly worked hard in terms of sourcing to cover new ground on an old topic. PS thanks for the links Sam, there are definitely some sites I did not know about in there, someday you should publish how you find all these sites! I think the public in general, which is less tech savvy then your average blogger and much less tech savvy than those of us in IT, has a shallow and skewed perception of blogging. A while back, local SoCal food blogger Henry Chan of Henry Chan's Food Videos was interviewed by a news channel that was doing a story on blogging. The video is embedded in the third comment. The story has since been carried by a number of local and national news stations. It's interesting to note how little the reporter himself knows about blogging, and how he mischaracterizes it. Henry mentioned to me that the reporter asked him a series of insistent leading question in order to come up with the sappy/smarmy closing statement to the report. Looks like someone was sent into the field with instructions to come back with a human interest story. Given the gap in understanding between the average newspaper reader or TV news watcher and members of the blogosphere, the slant taken by the the SF Chronicle article is understandable. Here's a repost of the link to the video. The raw URL was truncated in my first comment. I'd be upset too if they published my age. This is about the sixth anti-blogger article in the "San Francisco Chronicle" in the last two weeks. They're scared, not so much of losing money (Craigslist already took care of that) as of losing power. Whoever controls information is the gateway to lots of goodies and the rich, reactionary f---s who tend to own traditional media are being shown up as the lazy, unethical and manipulative jerks that they really are. Or is that too harsh? In any case, you're a much better journalist, with better ethics, than anyone currently on that paper. Well, in the same way that they took your quote out of context, I sure hope that's the case with Marcia at Tablehopper because she comes off as being quite arrogant. Surely that's not the case. Anyway, whether it's Yelp, Marcia, or us, I think the more the better. Long live the Populist Tyranny. PS Thanks for the link, Sam! Worse than publishing your humorous comment about training was how the article neglected to mention your code system for your restaurant reviews. Whether you (or any other blogger) has made one, two or many visits will have a significant impact on how I view the review. On a related note, how often does the Chron publish their "code of conduct" for reviewers? I just want to point out to everyone because maybe I didn't make it clear - originally the journalist, Justin Berton, fact checked everything, word for word, that he had written about me and I agreed for him to use that comment (yes he actually asked me if he could) because it was a light hearted aside that was in the context of a much deeper exploration about my blog and its strict ethical approach to reviews. must have lost his control of the article and when it was merged to include a second writer, Stacy Finz, and her POV, most of what he had written about me was consequently chopped and nothing was ever fact checked again. I don't know why this happened, but can only assume that the paper did not want to focus on showing a food blogger in such a good light. The journalist actually told me "you appear to follow the 'The Association of Food Journalists Food Critics' Guidelines" which is actually what led to my discovery of them. Yes, it seems I was acting all professional without even realising it. He has even advertised his future dining at a certain restaurant on his blog with a live HTML link to the restaurant in question, blowing the concept of anonymity out of the window. It is disappointing they turned the piece around into more of an anti-blog one because I am pretty certain it did not start out that way. I can only assume that the Food Section is nervous and scared. And the fact that SFGate are so scared of giving links - what is that all about ? - they don't even provide a live link to their own poll on the subject. I spoke to Stacy Finz on Wednesday - I had a feeling this would turn out as a negative piece. This article was misinformed - not to mention insulting. "Food bloggers dish up plates of spicy criticism"? "Free-for-all for online amateurs"? It seems like the real gripe was with Yelp, Chowhound and other anonymous review sites - yet the bulk of the criticism was leveraged towards bloggers. Are you trying to alienate a group that has a combined readership which DWARFS the SF Chronicle? Bloggers have a FOLLOWING because they have developed a report with their readers. Do you trust the opinion of a friend you have known for years? Just because blogging is a 'free for all' does not mean that opinion is valued. And obviously, Finz & Burton are totally unfamiliar with the food web (or perhaps spinning the facts to fit this article's premise). Most food bloggers won't even go to the trouble of posting a bad review. If anything the bias is positive. More often, you'll see a down to earth play by play of a restaurant experience. Here's an idea - restrict the power of opinion to mainstream media. Destroy the internet. Put influence solely in the hands of reporters. And while your at it, restrict free speech so as to avoid any untrained professional from offering food related guidance. Not to mention - the article totally ignored the community aspect of YELP and CHOWHOUND. As if a group consensus never enters into the picture. I thought your profile was still positive, and more importantly, real. Whatever positive or derogatory may be said by print media about blogs, the fact that Frank Bruni and Michael Bauer have both started blogs speaks for itself. honestly, i dont think anyone should be taking restaurant reviews seriously. mostly because not all of us share the same food preferences or tastebuds. of course, reviews are fun to read and i dont think bloggers are any less qualified than the media/print 'professional'(whatever that means) reviewers. people who read the reviews should take it with a pinch of salt. it's just lunch or dinner. there are so many people out there who claim to be adventurous about their food choices. just because a blogger says that pig feet or rabbit ears is 'disgusting'/'delicious' isnt going to discourage/encourage others to try it. why not try and use that same sense of adventure to try out new restaurants. i am only bringing this up because it is a pet peeve of mine. i am amazed by the willingness of some people to try out new foods while still expressing stern reluctance to give a new restaurant a chance because of one single review. if a restaurant is truly ghastly, it cannot survive anyway...word of mouth/reviews become more credible when a restaurant is subjected to multiple reviews/consistently bad delivery from the kitchen. also, restaurants depend on first timers and repeat customers to survive. getting perfect food out of the restaurant kitchen all the time is very difficult even though that is a valid expectation. there has to be some slack given for dodgy service or one bad night in the kitchen. it happens! the truth is that most high end restaurants escape bad reviews because they are 'destination' restaurants. one bad review about per se isnt going to ruin it's business. unfortunately, a bad review about a mid-range/around the corner lunch type place/mom and pop place will have a huge impact on someone who doesnt have some financial backer to financiallyb pad the fall that follows bad reviews. congrats on being into the Chron. I check only on-line right now (traveling) but you were the picture at the top of sfgate front page. Pretty amazing. The article is not perfect, but the exposure is invaluable: people interested in food blogs will discover yours, and once they see how sophisticated and pro you are, they'll stick. No one will believe you are one of these yelp drive-by reviewers, because there is no substance to that claim. Sam, nice response to this article. They do seem to be rehashing over the same points here, don't they? In any case, I agree with Cedric that the exposure will mostly likely be positive, however clever the Chronicle thinks it's being (ha! there's a joke) with its snarky attitude towards bloggers. And of course, congratulations on the Chronicle appearance. That's quite exciting :) Cheers. I read the piece, and it does seem to give food bloggers and our influence, be it good/bad/large/small, short shrift. It's mostly about the masses (informed or not, you decide) and their late night online ramblings on Yelp. I found it interesting, as I was having a similar conversation about Yelp recently with a restaurant owner, who really does not like Yelp. Strenuously does not like them. It would be interesting to read a piece on food bloggers that highlighted some of the good parts of what we do. It's easy to toss off an "oh, they're just threatened" comment about traditional media and I don't know, maybe they are, but as I don't think the mass media are going out of business anytime soon, that sort of thinking strikes me as too simplistic. Still, I think the piece would have been better rounded if it had described your requirements about restaurant reviewing and shown how not all blogs or online opinions are created equal. Sam - nice, polite response. I'd have stuck two fingers up - or maybe just one since they wouldn't have understood two! I wasn't expecting much since he called me as well but then never followed up - perhaps because he finally bothered to check and realised that I don't do reviews! I'm also astonished that people take sites like Yelp seriously - at least on Chowhound people act like they care about food a bit. I signed up for yelp because people at work were using it - then I realised how little they know - or cared - and stopped. Anyplace that has a majority of commenters dumping on a barbecue joint because it isn't 'texan' enough - when it is a St Louis barbecue joint - and criticises it because they play jazz rather than country and western music (comments made by several commentors - admittedly mixed in with good comments) has got to be a total waste of time. Even though I don't have anything to add to the previous comments, I wanted to let you know your post on the article really summed up how I felt. I wonder how non-bloggers are viewing the chron piece (if they even read it) and if they see its flaws like we do? What surprised me was this non-story of sorts getting top of the fold front page placement on Sunday, which means to me ex print journalist and editor that I am, that they thought it would be "spicy" and sell papers, which leads to impure thoughts about other motives involved in its creation/re-editing. Thanks for all the good you do in the blogging and food communities in the Bay area. I read you more than I read Michael Bauer, that's for sure. 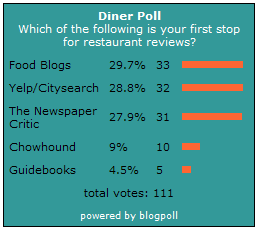 Since my blog is fairly new (since November 2006), I have been focsed on building readership and community, but I think bloggers have a right to review restaurants that they go to. If you are blogging about food and don't say anything about a restaurant you visited, it seems to ignor a big part of your own food life. I also think bloggers can benefit restaurants since many smaller "mom and pop' type restaurants that might not be reviewed in the newspaper get a chance for some exposure. Thanks for the nod! I'm honored to make the list. And as far as the traditional press is concerned, well, too bad for them. The game has changed. The democratization of the media represents a major paradigm shift. Sure, it requires a more educated public: You can't read any one, singular review and take it as gospel, you've got to be a bit more discerning. Sites like Yelp fill a need. Bloggers like you and I fill another. They're different sources to turn to for different reasons. But thank God there's more than one voice in the mix nowadays. And there's room enough at the table for all of us. update can happen 15 years after the initial review. Yes, it's professional. How many bloggers individually revisit the same places and sample the whole menu. Is that a scam? Swag: The The Association of Food Journalists Food Critics' Guidelines do not specifically cover this scenario so it is unclear how professional The Chron's method's are in this respect. I have been the guest of a Chron food critic on one of these repeat visits so I do have some experience. They could be more transparent, perhaps, and sometimes they are, I have noted, other times less so. I have never claimed to have invented publishing, but I do continue to live my own rules which happen to be more transparent than most publishers. I often make return visits (on my own dime) before writing reviews. Read my last review about Perbacco for an example.